A construction company, Sheetal International Private Limited, has allegedly grabbed land for residential area in Sector 51, Gurgaon, costing about Rs 200 to Rs 250 crore allotted by HUDA. situation here, particularly in the Bishnoi dominated areas of the district. Angry supporters of suspended Congress MP Kuldeep Bishnoi blocked traffic on the Balsamand road here this morning for over two hours. Supporters of Congress MP Kuldeep Bishnoi exchange hot words with police officials during a protest in Hisar on Friday against the impounding of vehicles by the police. Frequent rallies being held by Haryana Chief Minister Bhupinder Singh Hooda is making his political adversaries spew venom at him. A labour department team from Chandigarh led by a deputy director yesterday conducted a surprise raid at about five spots in the city and found children, below the age of 14 years, working at those places. Some unidentified youths allegedly entered the bridegroom’s house and made bids to outrage modesty of women on November 21. They allegedly looted jewellery and cash. Several persons were injured in the incident, which occurred at a freedom fighter’s house at Mandolla village. A high-level team of the Haryana technical education department inspected a site of around 160 acres near Kilord village last evening for setting up an Indian Institute of Technology (IIT). Some unidentified youths reportedly set afire the storeroom of Bhim Stadium here last night. They also damaged various articles. Governor A. R. Kidwai inaugurated Mahatma Chhotu Nath Park in Jatu Luhari village, 10 km from here, today. Built by the Baba Jagan Nath Udyan Samiti, the park was set up at a cost of Rs 5 crore. On the eve of World AIDS Day, a get-together of HIV+ persons and their families was organised at Karan Park here today. The programme was organised jointly by Krishan Lal, his wife Baljinder Kaur, both members of the Network of Positive People (Haryana), and Balwinder Singh, who claims to have cured 150 HIV+ patients. Haryana MLAs coming to attend the next session of the assembly will have a pleasant surprise in store for them. They may not even be able to recognise whether it is the same house in which they had been raising “people’s issues” for the past so many years. The Punjab and Haryana High Court today declared 99 candidates as successful in the main written examination of the Haryana Civil Service (Judicial branch), which was held here from November 16 to November 18. The police today found two bodies with injuries marks from different places in Dabwali town here. In the first incident, Harikesh Rai was found dead near a level crossing and with serious head injuries. Three armed youths allegedly looted Rs 25,000 and a gold chain from another youth in broad daylight at the local Hansi Gate market today. Former deputy speaker of Haryana Vidhan Sabha Gopi Chand Gehlot alleged this while interacting with mediapersons here today. He disclosed that the HUDA in 2003 had allotted 305 residential plots through draws for which possession were to be given by 2005. He said three days back when some of the allottees visited the site, they found that the construction company had demolished the eight parks, two shopping complexes and one community centre of the sector. Besides, the company also damaged some of the roads, electricity poles and sewer connections. It also demarcated the land and had started digging for constructing some building. Gehlot said when some of the allottees complained to the HUDA, officials concerned said no licence had been issued to the builder and they were not aware about the construction going on in Sector 51. Recently, the deputy commissioner had ordered that any person, who would damage the government property, would be punished by the administration. He said if the administration was unaware about the offenders in this case, then how would they punish the other lawbreakers. 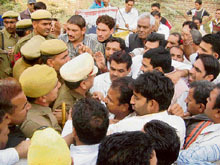 Gehlot said the HUDA administrator told the allottees that the fact came to his notice yesterday only. Vinod Sharma, whose wife is the owner of an 8 Marla plot in this residential colony, said the possession of the plots had not been given to them so far. He said HUDA officials had asked him to wait, as the process of allocation was very lengthy. Gehlot alleged that the present government was a cluster of land grabbers, who had cancelled the construction of a labour colony, which was to be set up at Manesar. Local MLA and parliamentary secretary, Haryana, Dura Ram’s announcement of organising a rally at Fatehabad on January 12 has created an interesting political situation here, particularly in the Bishnoi dominated areas of the district. Dura Ram, cousin of rebel Congress MP Kuldeep Bishnoi, has announced to organise a rally at Fatehabad, which will be addressed by Chief Minister Bhupinder Singh Hooda. The supporters of Bhajan Lal are in a fix as they had been attending meetings of both Kuldeep Bishnoi and Dura Ram in their area, but Dura Ram’s rally has put them in a situation where they have to decide whether to support Bhajan Lal or Dura Ram. The decision has also drawn severe criticism from some of the old loyalists of Bhajan Lal, including a brother of Dura Ram. Ever since the announcement, Dura Ram has been mobilising support for the rally. In a recent press conference, Dura Ram said the rally would be a big success and no real Congress worker would attend the Rohtak rally on December 2 being organised by Bishnoi. Devi Lal, younger brother of Dura Ram, has termed his brother’s decision as an act of treachery. Talking to mediapersons, Devi Lal, who is a supporter of Kuldeep Bishnoi, said whatever public following Dura Ram had today was due to the blessings of Bhajan Lal. Bishnoi is expecting a heavy turnout for his rally. His supporters led by Rajinder Chaudhary, alias Kaka, Balwan Singh Daulatpuria and Bimla Rohaz has been mobilising support for the rally here for the last one month. Dura Ram has been maintaining a close watch on developments and has been meeting sarpanches of villages and members of panchayats to feel their pulse. He has been making several developmental announcements in villages. 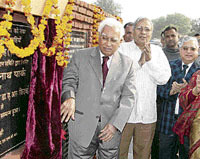 He maintained that Hooda would announce a myriad of new development schemes for Fatehabad in the January 12 rally. They were protesting against impounding of several vehicles by the police which were hired to ferry villagers to Rohtak on December 2 for the “janhit rally”. Bishnoi supporters started gathering there when the news of the police action spread. They blocked traffic and burnt effigies of the police authorities. Meanwhile, a strong police posse was rushed to the spot along with fire engines to meet any eventuality. The angry protesters damaged police vehicles. Later, after long and angry arguments with senior police officers, it was decided that the vehicles would be challaned but not impounded. The Bishnoi supporters dispersed thereafter. Dozens of organisations and individuals have issued press notes criticising Chief Minister Bhupinder Singh Hooda for trying to subvert the rally. They alleged that the Chief Minister was using unfair means to keep people from attending the rally. Meanwhile, the private residence of Kuldeep Bishnoi and his father and former Chief Minister Bhajan Lal has been turned into a war-control room with last-minute arrangements being finalised for what their supporters claim to be “the biggest event of the young MP’s political career”. The house remained swarmed by hundreds of supporters coming in and getting out throughout the day. Bishnoi’s cousin Devi Lal is heading the command of the rally. KARNAL: The police resorted to a mild lathicharge when a group owing allegiance to Bhajan Lal tried to forcibly take back taxis impounded by the police from the bus stand here today. According to Karnal SP A. S. Chawla, the police and officials from the excise and taxation department had set up nakas to check taxis which were plying without proper documents. He said these vehicles were crowding the city and causing problems for the commuters. On the other hand, Zile Ram Sharma, a former Congressman and Bhajan supporter, said they had booked a large number of taxis to transport people to Rohtak for the rally and this step of the district administration was a move to derail the rally. “The vehicles we had booked were impounded and taken to the bus stand by the police and when we were informed about this, we at once reached there. When we tried to get the vehicles freed, the police resorted to a lathicharge,” said Sharma. SIRSA: Bishnoi supporters on Friday blocked traffic for over two hours on the national highway here. They were protesting against the challaning of their vehicles by the police which were to be used to carry Bishnoi’s supporters to the “janhit rally”. DSP Pratap Singh Yadav and SDM Harish Chander Bhatia also reached the spot to pacify the protesters. FATEHABAD: Bishnoi’s supporters here have launched an intensive campaign for the success of the rally. Fatehabad being the district where the ancestral village of Bhajan Lal is located, Bishnoi’s supporters here have launched all-out efforts to mobilise maximum people from the district. Bishnoi’s supporters Balwan Singh Daulatpuria, Rajinder Chaudhary 'Kaka' and Bimla Rohaz have hired vehicles to ferry supporters to the rally venue. The supporters plan to leave with their convoy of vehicles on December 1 night to avoid being trapped in traffic jams. Meanwhile, various factional leaders of the Bishnoi camp, who had been campaigning separately for the rally, came on a common platform today when Daulatpuria addressed mediapersons at his office on the Sirsa road. Flanked by Rajinder Chaudhary 'Kaka', Bimla Rohaz, Anoop Dhuria and Inderjit Poonia, Daulatpuria claimed that over 25,000 people from the Fatehabad assembly seat would participate in rally and added that the figure would cross 75,000 from the district. REWARI: Describing the “janhit rally” as a self-promotion rally of the father-son duo, HPCC spokesman Ved Prakash Vidrohi has pointed out that a peep into Haryana’s political history of the past three decades revealed that Bhajan Lal always earned elevation in politics through sheer machinations and stratagems. Vidrohi said it was surprising that the Bhajan family whose one-point programme had always been to amass assets and power only for themselves was now organising a rally at Rohtak for the “welfare of the masses”. Satpal Kaushik, Haryana Pradesh Congress Committee (HPCC) secretary, who has thrown his weight behind the dissident faction of the party headed by Bhajan Lal and son Kuldeep Bishnoi, today came down heavily on Hooda for holding too many political rallies in the state in too short a time. Talking to this reporter, Kaushik said the holding of frequent rallies by the ruling party was bringing development work to a standstill. He said a series of rallies being held by Chief Minister Hooda was a panic reaction to the proposed rally by Bhajan Lal and Bishnoi in Rohtak on December 2. Though government functionaries would not readily admit that rallies by the ruling party slowed down the pace of development work, there was at least one example of an important review meeting of development work of a division getting cancelled in view of the Congress chief Sonia Gandhi’s visit to Haryana on November 28. An official meeting to review development work in Rohtak division was slated to take place on November 28. The meeting, however, did not take place. Divisional review meetings, which are attended by the secretaries of health, PWD (B&R), water supply and sanitation, irrigation, development and panchayats, among others, are important events from the development perspective. Ongoing development work in all districts falling under the division are reviewed during a meeting. Though Bhiwani district, where Sonia Gandhi had come on November 28, does not fall in Rohtak division, the engagement of some of the officers in Sonia Gandhi’s programme reportedly led to the cancellation of the meeting as it was felt that an effective review of development work could not be accomplished in the absence of those officers. Importantly, two more major rallies by the ruling Congress are in the pipeline in the state during the next 10 days. On December 2, when Bhajan Lal and his son Kuldeep Bishnoi are scheduled to hold in Rohtak their first-ever state-level rally, Chief Minister Hooda, too, will address a rally at Shahabad. The following Sunday, Hooda will be again addressing a rally in Karnal. The owners of the shops and establishments, where children were found working, have been booked under the Act concerned, which envisage a penalty ranging between Rs 10,000 and Rs 20,000 and imprisonment up to one year. Jind is one of those districts in the state where no labour official is posted at present, though certain posts exist at Jind, Safidon and Narwana sub-divisional headquarters, claimed an employee of the local administration. An official posted at Bhiwani supervises the work here, he added. The children were found working at five places, including a restaurant, liquor vend located near the local bus stand, a shop opposite the Government College, a tea stall near a college for girls and another commercial point in the city. The officials issued challans against the offenders. Some unidentified youths allegedly entered the bridegroom’s house and made bids to outrage modesty of women on November 21. They allegedly looted jewellery and cash. Several persons were injured in the incident, which occurred at a freedom fighter’s house at Mandolla village. The wife of the freedom fighter, Basanti Devi, has written a letter to Chief Minister Bhupinder Singh Hooda seeking his intervention and justice. She said in the letter that some unidentified youths entered her house and started teasing women when her grandson had gone to Birohad village to take his bride. They snatched gold chains from two women and purse of groom’s mother. The armed youths beat up male members, when they opposed. The letter has also been sent to the superintendent of police and deputy commissioner. The panchayat of Kilord has donated the land. The team, led by financial commissioner and principal secretary of the department Ajit M. Saran, included director, technical education, M.P. Gupta and other senior officers. Deputy commissioner D.P.S. Nagal, SDM A.S. Maan and local revenue officers were also present. The team reportedly appreciated the location as it is hardly 7 km from Sonepat, adjacent to two parallel canals — the WJC Delhi and the New Delhi canal — and the area is pollution free. Representatives of the panchayat, vice-president of the state unit of the All-Kisan Sabha and residents of the neighbouring villages were also present. The panchayat assured the team that more land would be donated, if required. Reports said these youths had committed such crimes at some other places of the town also. According to information, cricket coach Darshan Lal Midha noticed the fire in the storeroom when he reached the stadium today. He immediately called for help and extinguished the fire with water and sand and informed the sports officer, Manjeet Singh. Besides damaging sports articles, the miscreants damaged the stage constructed for “smriti rally” in the ground. Sportsmen said hoardings related to the government and cremation ground were also uprooted. The sports officer estimated a loss of over Rs 40,000. Governor A. R. Kidwai inaugurated Mahatma Chhotu Nath Park in Jatu Luhari village, 10 km from here, today. Built by the Baba Jagan Nath Udyan Samiti, the park was set up at a cost of Rs 5 crore. Dedicated to Azad Hind Fauj soldier Ran Singh and Phool Singh, the park is spread over 13 acres .Fruit and other trees besides flowers have been planted in it. A philanthropist, Dr Ranjeet Singh, donated land for the park. The park also has a temple of Mahatma Chhotu Nath while its main gate has been named after Governor Kidwai. Dr Kidwai said besides improving the health services and educational institutions, the setting up of parks should also be given priority in the rural areas so that villagers got facilities similar to those available in the urban areas. On the eve of World AIDS Day, a get-together of HIV+ persons and their families was organised at Karan Park here today. The programme was organised jointly by Krishan Lal, his wife Baljinder Kaur, both members of the Network of Positive People (Haryana), and Balwinder Singh, who claims to have cured 150 HIV+ patients. Balwinder, a resident of Samli village, said he became HIV+ about five years ago and was so depressed that he decided to end his life. When he was about to commit suicide, he met a wandering “baba” who heard his story and gave him a medicine to cure him of this disease. “In the past four years with the help of this ‘desi’ medicine, 150 HIV+ persons have been cured of the disease,” claims Balwinder. Interestingly, Balwinder is still HIV+ and only one of the patients ‘cured’ by him was present there. Meanwhile, Krishan Lal said there was need for setting up drop-in centres where HIV+ patients had access to antiretroviral therapy (ARV). The ARV is a combination of drugs meant for such patients. “We don’t believe in ‘desi’ medicines. We want the government to set up centres where people have access to medicines and latest information on the disease,” Krishan said. “Only the ARV can prolong the life of an HIV+ person,” he added. Krishan Kumar, another HIV+ patient, said he only discovered that he was suffering from this disease a month ago and had now developed wounds on his chest which were not healing. He said he was taking ‘desi’ medicine. Haryana MLAs coming to attend the next session of the assembly will have a pleasant surprise in store for them. They may not even be able to recognise whether it is the same house in which they had been raising “people’s issues” for the past so many years. The state public works department is engaged in a stupendous task of giving a complete makeover to the interior of the house before it meets again for the budget session. While giving a new look to the house, the department is ensuring that the basic design envisaged by Le Corbusier is not tampered with much. The benches on which the members sit are being redone, but the colour scheme is being kept as per the original. A modern sound system is being installed. A new flooring at the entrance to the Vidhan Sabha as well as in the corridors is planned. The press gallery is being provided with new sleek chairs so that more mediapersons can be accommodated. The press lounge will also get a new flooring and new furniture. Similarly, the Speaker’s room, the Chief Minister’s room, the parliamentary affairs minister’s room and committee rooms are also undergoing renovation. For the first time, provision is being made to provide a room to the leader of the opposition inside the Vidhan Sabha. A modern look is being given to the staff canteen. The library will undergo a major change. A reading lounge and reading cabins are being constructed for those who are interested in serious research. Secretary,PWD, K.K. Jalan told TNS that a plan was afoot to digitalise the library records. He said the endeavour was to create an ambience conducive to a healthy discussion in the house. Earlier, a preliminary examination was conducted by the high court, in which about 4,000 candidates sat. Of these, 554 candidates were shortlisted for appearing in the main written examination. A spokesman for the court said here today that the result had been declared within a record time of 12 days from the last day of the examination. The following are the roll numbers of the successful candidates: 5506, 5508, 5511, 5512, 5517, 5520, 5523, 5525, 5536, 5537, 5543, 5554, 5555, 5561, 5569, 5587, 5594, 5599, 5603, 5617, 5624, 5627, 5628, 5637, 5643, 5644, 5650 5655, 5665, 5666, 5682, 5691, 5699, 5703, 5706, 5708, 5709, 5725, 5728, 5730, 5734, 5753, 5765, 5767, 5768, 5771, 5776, 5777, 5781, 5788, 5795, 5798, 5807, 5810, 5812, 5813, 5814, 5816, 5817, 5820, 5821, 5822, 5845, 5853, 5854, 5855, 5856, 5859, 5862, 5864, 5881, 5906, 5908 5918, 5927, 5928, 5932, 5937, 5945, 5962, 5978, 5980, 5984, 5988, 5990, 5994, 5997, 6000, 6003, 6011, 6012, 6014, 6016, 6017, 6018, 6025, 6049, 6050 6054. The spokesman said the interviews would be conducted soon. However, the exact dates have not yet been finalised. There are 54 posts to be filled. The police today found two bodies with injuries marks from different places in Dabwali town here. In the first incident, Harikesh Rai was found dead near a level crossing and with serious head injuries. In another case, the body of Kewal with injury marks was found in the same town, said the police. Sources said the police was working on finding out the similarities between the two cases as both bodies bore serious injuries marks. The trio intercepted Rohit, who was passing through the market, and snatched his bag and chain. The three youths also beat up Rohit. A complaint has been lodged with the police.